The political football that has become the Thompson Divide took a big bounce in favor of those wanting to keep gas drilling out of the area last week with the Bureau of Land Management’s formal decision to cancel 25 undeveloped leases. However, the latest move by one energy company that held a majority of those leases and plans to seek damages in federal court over the decision suggests the game is far from over. 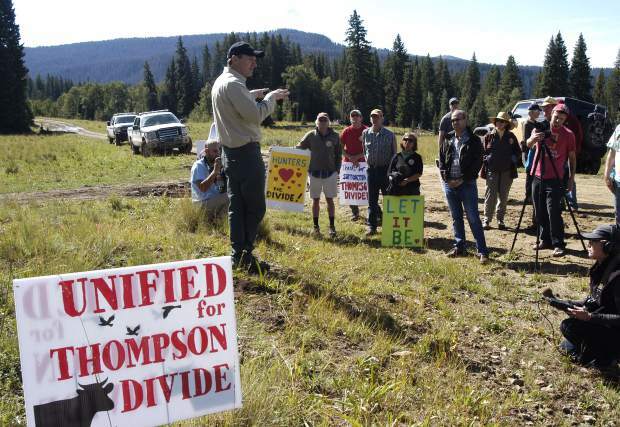 Last Thursday, the same day the decision to cancel the Thompson Divide leases was announced at a Denver press conference attended by U.S. Interior Secretary Sally Jewell, Houston-based SG Interests applied with the BLM for a drilling permit on another of its leases, located within the 9,200-acre Wolf Creek Storage Unit. SG holds 11 federal leases within the Wolf Creek Unit that were not among those canceled following a retroactive BLM review of 65 oil and gas leases on the White River National Forest southwest of Glenwood Springs. The Wolf Creek field, situated due south of the Four Mile Park area, is used by Black Hills Energy (formerly SourceGas) as an underground storage area to serve customer needs in the Roaring Fork Valley. It was the site of a September 2015 protest by supporters of the Thompson Divide Coalition, a group that has sought for more than a decade to keep drilling out of the area, when SG and U.S. Forest Service officials conducted a required site visit as part of the federal permitting process. “As we have stated repeatedly over the last several years, SG plans to develop the Mancos Formation underlying the Wolf Creek Unit,” Robbie Guinn, vice president for SG Interests, told the Post Independent. If the test well is approved and proves successful, SG would look to fully develop its Wolf Creek leases. That would require seven to 10 well pads in the area. “Initial well results could change that,” Guinn said. At least for purposes of drilling and testing the initial well, the plan is to use Four Mile Road and Forest Road 300 as the main access route, he said. Both Garfield County and Glenwood Springs have objected to the use of the Four Mile corridor as a haul route, mainly because the road is not built to industrial-level standards. Glenwood Springs has also opposed the use of already-congested city streets that they say are inadequate to carry heavy oil and gas vehicles. Guinn noted that future access should larger-scale development occur would be analyzed through the required federal environmental review, including the potential for alternative routes. However, “To SG’s knowledge, there are no other existing feasible access routes to these locations,” he said. Zane Kessler, executive director for the Thompson Divide Coalition, said he was disappointed that SG hasn’t shifted its position in light of the decision to cancel other leases in the Divide area. The decision last week to cancel the 25 Divide-area leases, including 18 held by SG and seven by Ursa Resources, came after a two-year-long retroactive BLM review of 65 leases on the White River National Forest stretching south and west of Glenwood Springs. The other 40 leases, which straddle the Garfield and Mesa county lines toward DeBeque, are to remain active. About a dozen of those leases will come under new, more restrictive stipulations imposed by the Forest Service last year in its amended oil and gas leasing management plan. Under the decision, the BLM is to reimburse SG and Ursa a total of $1 million, which represents the amount the leases were originally sold for at auction more than a dozen years ago. Guinn said SG plans to seek relief in federal court for damages above and beyond that amount, given the investment the company has made toward developing the leases and potential future production that is now lost. He said SG will also contest the decision as politically motivated and “predetermined” by the Obama administration working in concert with environmental groups. “The BLM will find it difficult to defend their actions,” Guinn said in a statement released in conjunction with the decision. He said documents obtained through a Freedom of Information Act (FOIA) request prove that what would normally have been a routine process to consider drilling applications in SG’s Lake Ridge Unit where leases were canceled was halted in order to conduct the retroactive review at the request of environmental interests. The BLM has maintained that the review was done in order to correct deficiencies in the original lease analyses, because the agency did not adopt a 1993 Forest Service analysis or conduct its own review before the leases were sold. Kessler maintains that there is plenty of precedent for canceling leases that were improperly issued in the first place. “In fact, BLM has previously canceled leases held by SG interest in the Thompson Divide on two different occasions for similar legal deficiencies,” Kessler said of BLM decisions in 2009 and 2010 to eliminate leases within the Sunlight Mountain Resort ski area boundaries. The coalition will continue to make its voice heard when it comes to any attempts to drill within the Thompson Divide, he said. “We will do what we’ve always done to assist in elevating the voices of ranchers, recreation users, small businesses and local governments to make sure this area stays the way it is for generations to come,” Kessler said. Meanwhile, Guinn and Ludlam both said they will be looking to the incoming administration of President-elect Donald Trump to uphold oil and gas leasing rights. Ludlam agreed with Guinn’s assessment.